My next edWeb.net/emergingtech webinar (February 13, 2013 at 5PM, EST) is on global collaboration. Last year, Shannon Miller, of Van Meter School in IA joined me to co-present on this subject. It was a ton of fun to talk about our shared experiences, and to hear about Shannon's many long-distance collaborations. This year, Shannon has once again agreed to participate as we re-visit the topic. 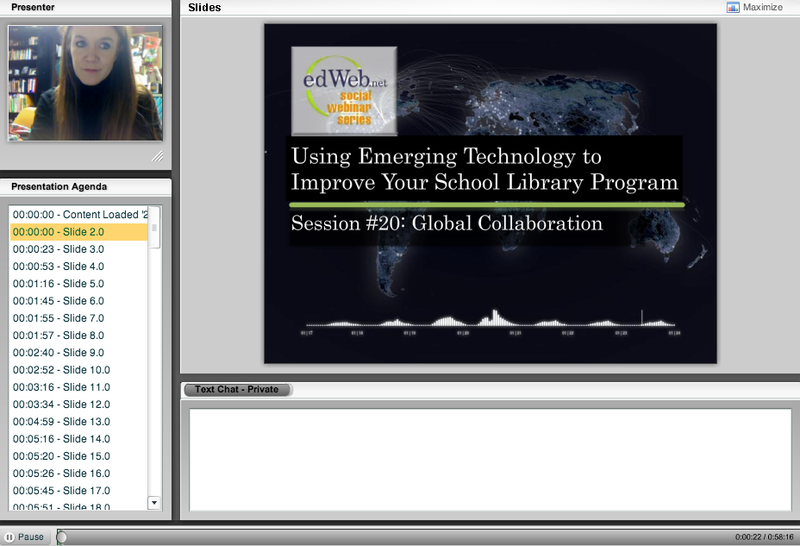 And when I posted the edweb.net/emergingtech syllabus, Beverley Rannow, school librarian for Otsego Public Schools in Michigan and edWebber from day one, offered to share her experience in the Peace Corps. Then I thought of Danny Ambrosio, former New Canaan High School student teacher, and newly hired school librarian at Thoreau Middle School in Fairfax County, VA, who spent time teaching in Senegal last year. Then I thought of Jeri Hurd, a Connecticut native who currently teaches in China, but who also taught in Turkey and Egypt. So I reached out to these folks, and asked them to contribute slides and sources to our session. But why stop there? Surely, there are many folks who want to share their long-distance collaborative experiences! So this is an invitation to all who have something to share about global collaboration. Join us by contributing your experience(s)! You can send a video if your time zone is incompatible with a live appearance at 5PM EST (GMT-5) - You can drop a link to a downloadable video in the comments below. Or you can participate by adding slides to our presentation, resources to our group, and joining us live on February 13 at 5PM, EST.